Firstly, thank you for the amazing response to the release of my new 2017 Pattern Folio and the Valentine's Day giveaway - it was wonderful to hear from so many of you and get your feedback. I have more on this and some questions for you at the bottom of this post, so I hope you will take the time to have a read through and let me know your thoughts as this info helps me with future ideas and the direction that I go with A Little Lime. Firstly, though, some fun stuff. I often work on little projects that I don't feel warrant a blog post but still end up on my Facebook Page (click that link if you'd like to connect with me there), so I thought I'd share some of what I've been doing of late. 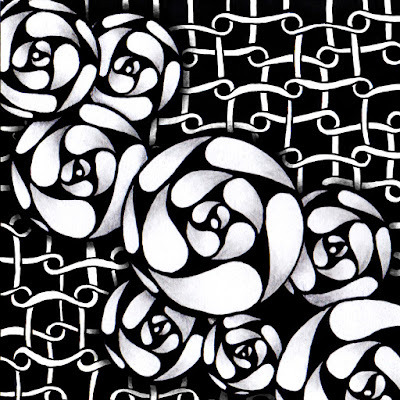 This zentangle tile was created for a challenge using Buckled Up, a pattern by Tomas Padros and also features Spiral Roses which I am in the process of creating a step-out and video for. 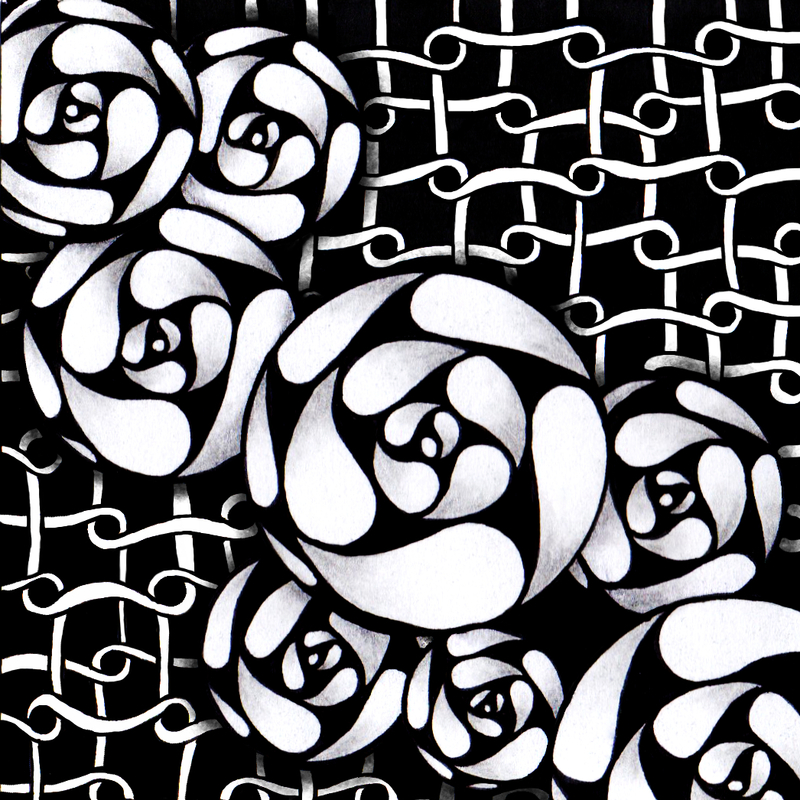 I don't do a lot of Zentangle tiles as I struggle with the size, but I had a lot of fun playing with Buckled Up. The version on my tile is "doubled" - this video shows how I approached it. If you enjoy the videos remember you can subscribe to my channel on YouTube I'm planning to do more videos this year, along with updating some of my older stuff. If you are a subscriber you receive notification when new videos are uploaded. I spent a bit more time revisiting Narwal and created a digital tile featuring this pattern supersized. That's about it for extra curricular artwork that I've completed though I've got a heap of half done projects and scribbled notes all over my desk that will hopefully turn into super-cool drawings when they grow up. hahaha. I can only hope! O.k., onto the folio/giveaway debrief and some questions for you guys. I really, really value your feedback as blogging and sharing online at times feels like working in a vacuum. If I get no reaction I really don't know if what I'm doing is working for you, so please know that I really appreciate it when you take the time to comment or send me an email. So, overall the giveaway was a big success - it was very experimental and I wanted to try it to see if it would work. The answer was a resounding YES! But like any experiment, I also learnt some things and have ideas on how it could be improved. Over the 24 hours, I answered approx. 600 emails (thanks, guys!) this was amazing and overwhelming (and tiring), but I loved it! I was so busy, in fact, I forgot to buy my husband his annual chocolate heart for Valentines Day. Suffice to say he was not as impressed by the one I made with two halves of a cherry tomato. hahahaha. true story. I know I took you all by surprise with the giveaway and there were a few people who missed out. Next time the plan is to send out a heads-up that a giveaway is imminent so that you all can be prepared and hopefully that will alleviate this issue. For some the ebook came as an attachment - did this happen to you? Does anyone know how this could happen? I don't get how this came about at all through a regular feed. I was sent a picture of the pattern title fonts looking squashed in the PDF - the document had somehow changed to a default font and, to be honest, looked awful. Did this happen to you? I did not think that this was possible with a PDF file. Feeling very confused. I'm hoping one of you lovely smart people can explain it to me. Is it to do with the personal PC/printer settings? And, finally - the folio is getting BIG. I think I've asked this before, but it doesn't hurt to get an update on your thoughts. Do you prefer the folio as a single book with every pattern from 2012 in it? Or would you rather have yearly editions with only the patterns from that year included? Lastly, I want to give a huge shout of THANKS!!! to all of you who also bought a copy of the new Pattern Folio, your support is amazing!! Have a fantastic weekend! I'm heading to the verandah with my book and a coffee. I would like to get a yearly addition... I haven't printed my be one out (out of ink lol). I have my original all printed out and in a 3 ring binder, I would be nice to just add to it as time goes on. And THANK YOU again!!! For those who missed a year, you could always offer a bundle price at the beginning of the year when you publish the latest folio. Although I don't usually respond, I do read each of your blog posts, and am going to follow you on FB now as well. Will try to be a bit more communicative this year. Thanks for the feedback Megan. Fantastic, Donna! Thank you. I'm starting to think the distortion must be a local computer issue. I don't understand it, but as long as it is not happening across the board, I'm o.k. I like getting the annual downloads. I print them and bind them in an easy plastic binder. In attempting to reduce my online time I like to pull books from my shelf to read and work from. I have no issues with your downloads - easy peasy. I know this takes a lot of time and effort and so appreciate you making this available to us - the content is amazing. Thanks!! The design titles were as per your sample above. And thanks again for your generosity. Hi, Helen - I like size of the booklet. Thanks so much for doing this. I didn't have any issues at all with the process. Thanks so much for sharing all this with us. I look forward to each installment. I vote for the yearly edition with only the current year's updates. I like the smaller size and I too save all your updates, so I have all the patterns from previous years. I downloaded my pattern folio from the link in your email and it is just fine. My downloaded PDF looks great. I thank you. I think I prefer just updating with current years patterns. I print mine and do not want to print out a full version every year. Last year I wanted to print out the complete booklet, even though I had all the previous years free versions. I thought the $4 was well worth it and that is what I will do if I fell like I want all of them together. I love your buckled up with spiral rose tile. Simply WOW! I looked at buckled up before, but never tried to draw it, it looked too brain intensive. But your video opened the door to this tangle and I will certainly try it. 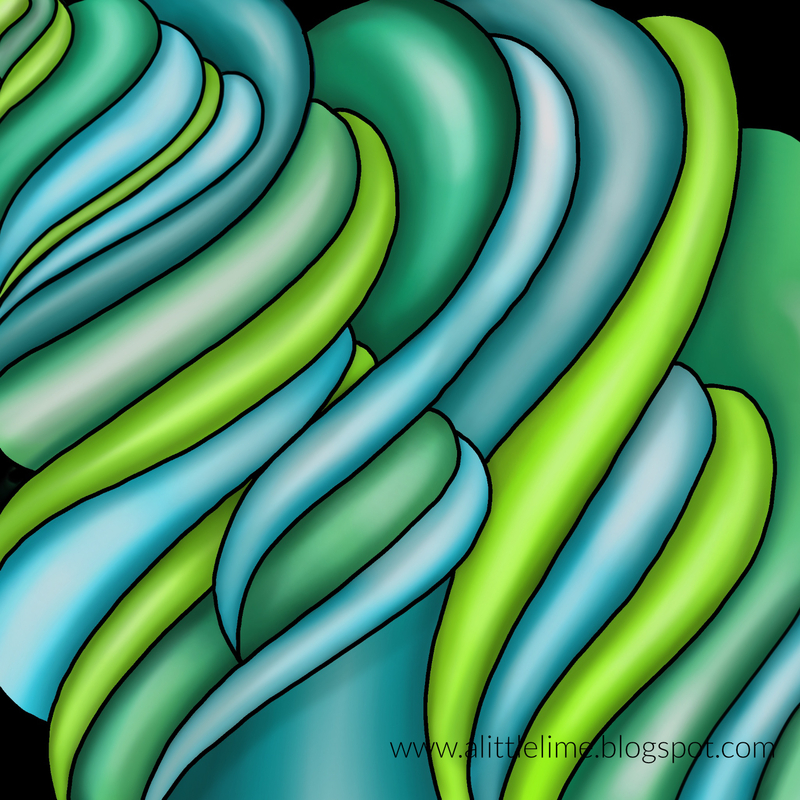 Meanwhile I am eagerly awaiting your Spiral rose step-out!! Thanks, Helen, for all the time you spend to accommodate us. I do hope you still find lots of time to just tangle. As for the pdf question, I sent you an email ....too long for comment section, but I do join the yearly update voters. I had no problem downloading the PDF. I use to print but now I don't so I'm good with a yearly update or otherwise. Thank you so much for sharing your creativity and step outs ! I have all your yearly publications and I just keep them instead of deleting them from my files. It would be nice to have 1 book then be able to add all the new pages to the end of the already owned book. You could offer the complete updated book each year for newbies and just the new pages for the oldies (for lack of better word). Either way count me in! Thanks Helen!